This geologic map is the result of a cooperative effort of the U.S. Geological Survey, the National Park Service, the U.S. Forest Service, and the Bureau of Land Management (BLM) and the Kaibab-Paiute Tribe to provide a regional geologic database for resource management officials of all government and agencies, city municipalities, private enterprises, and individuals of this part of the Arizona Strip. The Arizona Strip is part of northwestern Arizona north of the Colorado River and bounded by the States of Nevada and Utah. Field work on the Kaibab-Paiute Indian Reservation was conducted from 2002 to 2005 with permission from the Kaibab-Paiute Tribal Government of that administration and permission was granted to publish a geologic map of 4 quadrangles online (Billingsley and others, 2004). The Kaibab-Paiute Tribal government of 2006 to 2008 requested that all geologic information within the Kaibab-Paiute Indian Reservation not be published as part of the Fredonia 30’ x 60’ quadrangle (this publication). For further information, contact the Kaibab-Paiute Tribal government at HC 65 Box 2, Fredonia, Arizona, 86022, telephone # (928) 643-7245. Visitors to the Kaibab-Paiute Indian Reservation are required to obtain a permit and permission for access from the Tribal Offices at the junction of State Highway 389 and the paved road leading to Pipe Spring National Monument. The Fredonia 30’ x 60’ quadrangle encompasses approximately 5,018 km2 (1,960 mi2) within Mohave and Coconino Counties, northern Arizona and is bounded by longitude 112° to 113° W., and latitude 36°30´ to 37° N. The map area lies within the southern Colorado Plateaus geologic province (herein Colorado Plateau). The map area is locally subdivided into seven physiographic parts: the Grand Canyon (Kanab Canyon and its tributaries), Kanab Plateau, Uinkaret Plateau, Kaibab Plateau, Paria Plateau, House Rock Valley, and Moccasin Mountains as defined by Billingsley and others, 1997, (fig. 1). Elevations range from 2,737 m (8,980 ft) just west of State Highway 67 on the Kaibab Plateau, southeast corner of the map area to about 927 m (3,040 ft) in Kanab Canyon, south-central edge of the map area. 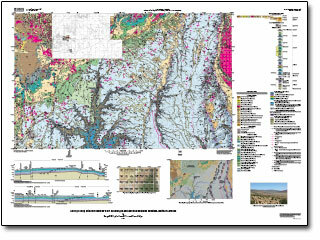 Billingsley, G.H., Priest, S.S., and Felger, T.J., 2008, Geologic map of the Fredonia 30' x 60' quadrangle, Mohave and Coconino Counties, northern Arizona: U.S. Geological Survey Scientific Investigations Map 3035, scale 1;100,000, https://pubs.usgs.gov/sim/3035/.